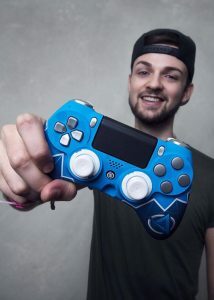 ATLANTA, GA., October 20, 2017 — Scuf Gaming, the maker of high-performance game controllers used by 90 percent of the world’s professional gamers, has teamed up with gaming influencer and celebrity Alastair “Ali-A” Aiken on a stylish new design, the “Ali-A Game On”. 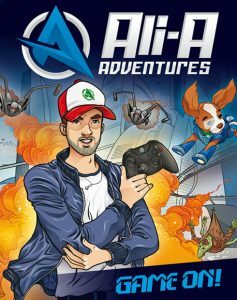 The new Game On controller is inspired by Ali-A’s new graphic novel “Ali-A Adventures: Game On”, which released October 19 in the United Kingdom by Puffin Books and on October 24 in the United States by Random House Books for Young Readers. In the book, Ali-A is depicted as a gaming icon who transforms into a superhero when merciless aliens crash the launch party for a hot new video game. The action takes readers from Ali’s transformation into the Liberator all the way to the final boss battle. As an iconic member of the gaming community in real life, Ali-A has built two YouTube channels with over 13 million subscribers combined. He is also the host of Ali-A’s Superchargers on CBBC, in which kids give their parents’ tired old vehicles a hip new look. The Ali-A Game On SCUF is available for PS4, Xbox, and PC at scufgaming.com starting at $169.95 for the SCUF IMPACT (£134.99, 169.95€); $159.95 for the Infinity4PS PRO (£127.99, 159.95€); and $159.95 for the Infinity1 (£127.99, 159.95€). Scuf Gaming®, global leader and innovator of gaming peripherals and winner of eSports Industry Awards for “Best Hardware” in 2016, provides tactical gear for elite gamers where over 90% of the top professional gamers in the world use SCUF. 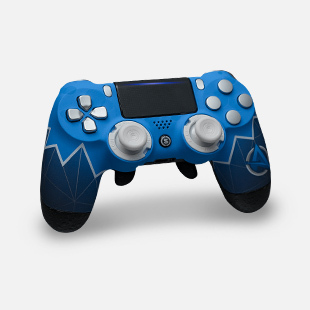 Selling high-end accessories and customized gaming controllers for console and PC, SCUF offers a number of functional and design features custom built to increase hand use and improve gameplay. Built to specification, SCUF controllers cater to competitive and casual gamers who recognize that one size does not fit all. The SCUF controller has features, which are covered by 36 granted patents, and another 69 pending; protecting 3 key areas of a controller; back control functions and handles, trigger control mechanisms and thumbstick control area. For additional information about Scuf Gaming, please visit www.scufgaming.com or follow us on Twitter, Facebook, Instagram, YouTube, or Snapchat. ATLANTA, GA., September 26, 2017—SCUF Gaming, the innovator and creator of high performance game controllers, has teamed up with Porsche and Turn 10 Studios to design the limited edition SCUF FORZA ELITE controller in celebration of the October release of Forza Motorsport 7. 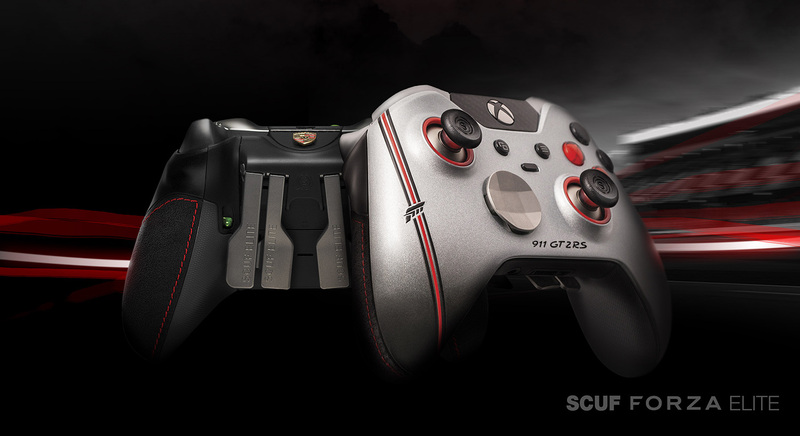 Inspired by the Porsche 911 GT2 RS, the cover car for Forza Motorsport 7, the SCUF FORZA ELITE’s front design is custom-crafted with an exclusive silver finish, red and black racing stripes, black carbon fiber accents, and the Forza logo. 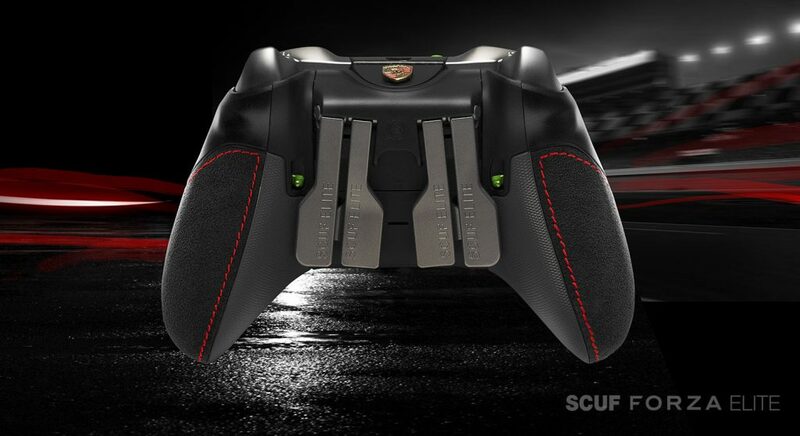 The luxurious controller handles are made of the same hand-stitched Alcantara leather found in the 911 Porsches. This limited edition controller includes SCUF’s signature paddles, hair triggers, and other key functionality used by over 90% of professional gamers. The controller features the iconic Porsche Crest in a vivid color set and high quality metal fabrication SCUF paddles which transcend the back of the controller for optimal reach and use. Similar to racing car tires, SCUF ELITE premium thumbsticks offer gamers superior grip and comfort to achieve optimal driving performance in Forza Motorsport 7. A range of thumbsticks heights are included and can be customized to the gamer’s preference. Additional features include red volcano rings, SCUF Pro Grip handles, a custom case, certificate of authenticity, and replacement controller parts. Forza Motorsport 7 lets everyone experience the thrill and beauty of competitive racing at the limit. As the premier 4K gaming experience on Xbox One and Windows 10 PC, Forza Motorsport 7 will be a visual showcase for fans of every stripe. 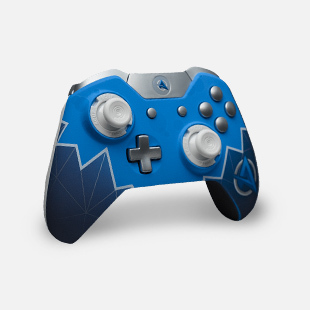 The first 50 SCUF FORZA ELITE controllers will be available for sale on October 7 at a special Launch Event hosted by SCUF Gaming, Microsoft, and Porsche at the Microsoft Store flagship on Fifth Avenue. Beginning at 9 a.m. EST, the Launch Event will feature Porsche cars on-site, and attendees will be able to participate in time trial gaming competitions and be the first gamers to use the SCUF FORZA ELITE controllers. Pre-orders of the SCUF FORZA ELITE begin that day at scufgaming.com and Microsoft website and will ship late-October. 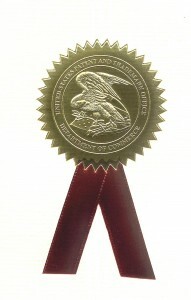 For more information, please visit www.scufgaming.com.